North Carolina's most experienced Vein Clinic. Varicose veins are enlarged, weakened, dilated veins that have permanently lost their ability to carry blood from the legs back up to the heart against the force of gravity. As the blood falls back down the leg and pools due to gravity, the veins overfill giving them their typical unsightly bulging appearance. Varicose veins cause tired, heavy, aching, throbbing, swollen legs which are typically worse at the end of the day. Nighttime leg cramps and leg restlessness (sometimes called Restless Leg Syndrome) are also very common problems caused by varicose veins. Treatment of the diseased veins will eliminate these symptoms. If left untreated, varicose veins always worsen over time, and may lead to the formation of blood clots (thrombosis), inflammation of the vein (phlebitis) and inflammation of the skin (dermatitis), and finally ulceration. What Causes varicose veins ? Heredity is the number one contributing factor causing varicose veins. A genetic tendency causes veins to weaken and wear out over time. The greater this genetic tendency the sooner it will happen. So regardless of treatment, if you have a strong hereditary predisposition, you will probably form new problems as time goes on. Other contributing factors include pregnancy, obesity, hormone-containing medications, standing for long periods, and traumatic injury to the leg. In most cases, nothing can be done to prevent veins from wearing out, but if effective treatment is given early in the course of the disease, complications like phlebitis, blood clots and ulcerations can be prevented and symptoms relieved. How are varicose veins treated ? Discussed below are several methods for treating varicose veins. The procedure or combination of procedures recommended is based upon the extent of your specific condition and your overall health and age. The doctor will recommend an ultrasound examination to assess the severity and extent of your vein disease, most of which may not be visible on the surface of the leg. Without an accurate ultrasound map of your veins we cannot determine the source of your problem or treat it effectively. The most conservative way to manage varicose vein disease is wearing prescription-strength compression stockings (usually knee length, but sometimes thigh length hose are needed). Compression stockings help alleviate the swelling and pain caused by varicose veins. These stockings will also help heal any skin inflammation or ulcerations which have developed. However, there has never been any evidence to show that compression stockings prevent the formation of varicose veins. Since the diseased veins that are causing the symptoms are not being eliminated, the compression stockings have to be worn indefinitely. Some insurance companies are now requiring patients to wear prescription strength compression stockings for 3-6 months before they will consider reimbursement for treatment. Sclerotherapy is ideal for treating small to medium size varicose veins. It involves the injection of a solution into diseased veins with the intent to create scar tissue inside the vein that will seal it closed. The veins then shrink and gradually disappear. The solution used is extremely safe and relatively painless. Anesthesia and sedation are not needed. For deeper varicosities ultrasound is often used to "guide" the injections into the underlying diseased veins below the surface of the skin. This allows the medication to be administered to precise locations safely and accurately. Sclerotherapy is often done during post operative visits to eliminate any diseased veins that were too small or too deep to remove during surgery. Thus, surgery and sclerotherapy are often complementary, ensuring that all the diseased veins are eliminated with treatment. Foam is made by mixing gas bubbles with a liquid, giving a consistency like shaving cream or mousse. One part of liquid solution will make 3-5 parts of “bubbly” foam. When injected inside a vein, the micro foam displaces the blood (rather than mixing with it) creating better contact with the vein wall. Improved contact between the medication and vein wall gives better and faster results. The expanded volume of the mixture also allows for less medication to be used at a weaker strength. Foam Sclerotherapy is nothing more than injecting air mixed with a liquid sclerosing solution (sclerofoam) rather than just the liquid sclerosing solution into the veins to be treated. Both small and large veins can be treated using a foam technique with or without ultrasound guidance. The amount of foam used is limited to avoid side effects and both techniques may be used together to obtain optimal results. Surgery is used to treat the larger varicose veins. Traditional surgery commonly referred to as “stripping” is now never needed. This procedure is painful, requires a hospitalization and a general or regional anesthetic. The permanent scarring that results from “stripping” is also unacceptable as is the lengthy recovery time. The newer catheter occlusion and micro-surgical procedures with emphasis on esthetically cosmetic pleasing results without permanent scarring is increasingly replacing the traditional Vein Stripping Surgery. There is not one operation or procedure that fits all patients. Recent advances in venous ultrasonography and surgical technology enable us to treat all varicose veins through very small incisions that rarely require stitching and provide cosmetically acceptable results. After performing a Duplex Venous Ultrasound exam an accurate venous map is made of the entire leg. When you know the precise anatomy and areas of diseased veins, the treatment can be directed toward the patient’s specific pathology instead of performing routine operations or procedures. It is this precise Duplex Venous Ultrasound Mapping that allows individually tailored treatment for every patient. All of our treatments are done in our pleasant office setting using conscious sedation and local “tumescent” anesthesia. There is immediate recovery and ambulation with the patient resuming normal activities usually the next day. Ambulatory Phlebectomy or “hook” phlebectomy is a micro-extraction procedure used to remove varicose veins, both large and small, which are close to the surface through very small (1/8 inch) micro-incisions. The micro-incisions are so small that they are closed with sterile tape and not stitches. Once healed they are rarely visible. Bruising will occur and will take a few weeks to go away. A compression bandage is worn for only 3 or 4 days. When removed patients are amazed how good the leg looks with the “ropey” veins gone. Then a compression stocking is worn for another week. Patients can return to normal daily activities including work the next day and walking is encouraged. Vein ligation is a minor surgical procedure where a large varicose vein is tied off through a small incision. This is necessary when veins are not working properly and the blood in them is leaking (refluxing) back down the leg. 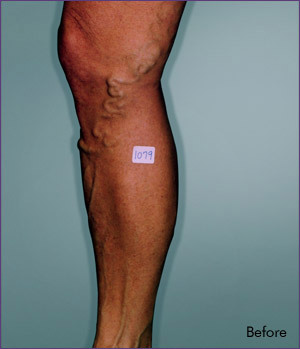 These incompetent veins are the source of most of the visible varicose veins seen on the surface of the leg. That is why; treating only the surface veins will not eliminate the source of the problem and will only lead to a poor result or a rapid recurrence of the original or a new problem. These refluxing (leaking) larger veins must be separated or disconnected from the rest of the healthy venous system. Ligation is performed in combination with Ambulatory Phlebectomy and/or Sclerotherapy which eliminates the source and the surface diseased veins. The Catheter Occlusion Procedures are effective alternatives to Vein Stripping Surgery without hospitalization, general anesthesia and no down time or long convalescence. Both the Laser and Radiofrequency Catheters heat up inside the vein sealing it shut. These procedures are performed in the office with conscious sedation and local anesthesia. The patient walks out of the office and may resume near normal activities including work usually the next day. The Endovenous Laser Catheter procedure is performed right in the office. Under local anesthesia, a thin laser fiber (or catheter) is inserted into the vein through a tiny incision. The catheter delivers laser energy (heat) to the vein wall, causing it to heat, collapse, and seal shut. Most patients return to work and near normal daily activities the very next day. The catheter is used to treat large diseased veins inside the leg which are often the cause of unsightly varicose and spider veins on the surface. In some cases, other treatments including sclerotherapy, ultrasound-guided sclerotherapy, ambulatory phlebectomy or ligation are used in combination with Endovenous Laser to achieve the best possible results. The VNUS Closure® Catheter procedure is also performed right in the office. Under local anesthesia, a thin radiofrequency catheter is inserted into the vein through a tiny incision. The catheter delivers radiofrequency (RF) energy to the vein wall causing it to heat, collapse, and seal shut. Most patients return to work and near normal daily activities the very next day. This catheter is also used to treat larger diseased veins inside the leg which are often the cause of unsightly varicose and spider veins on the surface. In some cases, other treatments including sclerotherapy, ultrasound-guided sclerotherapy, ambulatory phlebectomy or ligation are used in combination with VNUS Closure® to achieve the best possible results. Not all patients are candidates for the Endovenous Laser or VNUS Closure® procedures. The skilled physicians at Vein Help Clinics of Charlotte and The Triangle offer many state-of-the-art treatment techniques. Your treatment plan will be specifically designed and individually tailored for the extent and severity of your specific condition using one or a combination of the treatment options mentioned above. Contrary to the old-fashioned regimens of bed rest after vein treatment, our patients are instructed to walk as much as possible in the days following each treatment. This helps to re-route blood to the deeper, healthier veins. A compression bandage is worn for only 3 or 4 days after Micro-Surgery and Catheter Occlusion procedures. A shower bag is supplied for bathing with the dressing in place. Compression stockings are worn for short periods after all treatments to assist in healing and reduce any mild discomfort or swelling which may occur. Because mild sedatives are usually given during the Micro-Surgery and Catheter Occlusion procedures you will need to bring someone to drive you home afterwards. You may drive yourself to all subsequent post-procedure visits because sedation and anesthesia are not needed. These post procedure follow-up visits are very important. During these visits (usually two) we assess the efficacy of our treatment and evaluate your body’s healing response to the therapy. Often it is during this period that additional sclerotherapy, with or without Ultrasound guidance, is performed to insure the best long term results possible. TO FIND A VEIN SPECIALIST OUTSIDE THE RALEIGH/DURHAM AREA VISIT VeinsOnline.com.